This is the first article in the series of articles exploring the tools and techniques for analyzing, monitoring, and improving the performance of Java applications. In this blog we are going to discuss basic terminology and performance methodology. Excerpts from the book “Java Concurrency In Practice” by Brian Goetz.. Application performance can be measured in a number of ways, such as response time, latency, throughput, scalability, or capacity. Some of these (response time, latency) are measures of “how fast” a given unit of work can be processed or acknowledged; others (capacity, throughput, scalability) are measures of “how much” work can be performed with a given quantity of computing resources. Throughput is the amount of work that a application can do in a given time period. Example: Number of Jobs completed in a hour. Example: Say a Java application can complete 100 Jobs in 10 hours on a given hardware/DB configuration. Can the application complete 200 Jobs in 10 hours by doubling/increasing hardware/DB configuration? If the application completes the above task without modifying the code then we say the application is scalable. Improving performance means doing more work with fewer resources. Here “resources” means CPU cycles, Memory, network bandwidth, I/O bandwidth, database requests, disk space etc.. In practice the performance of an activity/application is limited by one or more of these resources. When the performance of an activity is limited by availability of a particular resource, we say it is bound by that resource: CPU-bound, Database-bound, I/O-bound etc. What about your application? Is it CPU-bound? or Database-bound? or Memory-bound? Tuning for throughput/capacity, the goal is usually to do the same work with less effort, such as by using better algorithms or using caching techniques. Tuning for scalability, the goal is to find ways to parallelize the problem so you can take advantage of additional processing resources to do more work with more resources. When Application Tuning is Required? Safety always comes first. Here “safety” means the functionality of the application/program. First make your program right, then make it fast. And then tune further only if your performance requirements tell you it needs to be faster. If your application/feature is not performing as expected. If an application is performing as well as expected, you don’t need to put additional efforts to enhance its performance. Performance analysis and tuning is a iterative process. than another, we need the understand the effect these decisions.. Under what conditions will this approach actually be faster? Example: Hardware/DB configuration, Application Settings, Cache Settings etc.. Under light or heavy load? Example: No. of parallel threads, thread count, No. of Concurrent Clients, No. Of Processing Threads etc..
With large or small (input/processing) data? All performance decisions should be supported with measurements. 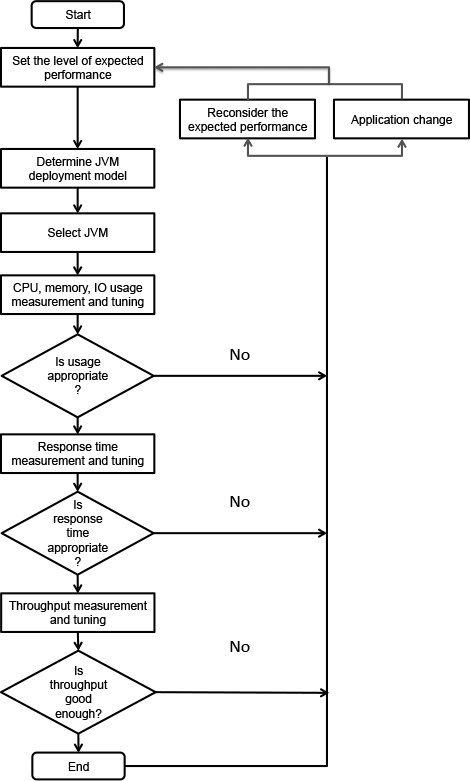 Fig A. shows a flow chart from the book Java Performance co-authored by Charlie Hunt and Binu John. This chart shows the process of Java application performance tuning. Concrete performance requirements. So that you know the target performance and know when to end the tuning activity. Step 1: The process starts with setting concrete performance requirements. Step 2: After we have the baseline data, we are ready to begin our performance tests by increasing the load (or) increasing the data size/network size (or) increasing the input size. Step 3: We need to measure/analyze the application using tools like thread dump , JConsole and profiler etc. Step 4: From the performance analysis/results collected, we can identify the bottlenecks that may have caused issues such as slow response times and high resource usage. Step 5: Make the required application/configuration changes. Step 6: Measure again after tuning/making changes to verify that you’ve achieved the desired improvements. Step 7: Repeat above steps until you meet your performance requirements. Application performance analysis/tuning requires systems knowledge. When you apply the systems knowledge on your application deployment, you can successfully tune an application. EhCahce with “diskPersistent=true” flag is used to persist the cache values to disk and can be used after system restarts. If you have many caches with “diskPersistent=true” then you may get “Too many Open files Exception”. This is because EhCache is using nearly 30 open file pointers for each cache and the default no. of open files for user in linux is 1024. So, to avoid this exception you need to increase the No. Of. open files per process/user. In Oracle adding Index for Foreign Key columns is important for performance reasons. And also if you are using transactions, It is important to create index for FK columns. With out index your application may experience many deadlock problems. These indexes are automatically generated for MySQL by Hibernate (In MySQL Index for FK columns is mandatory). But these indices are not generated for Oracle by Hibernate. So we need to explicitly mention indexes in hibernate mapping tables. For hibernate <list> </list> objects we can use <database-object> tag for explicitly mention the create/drop index. This procedure is for a Huawei E1731 USB modem that I got from Airtel. 2. Configure modem (Make sure you replace the<phone number> placeholder with your actual phone number.